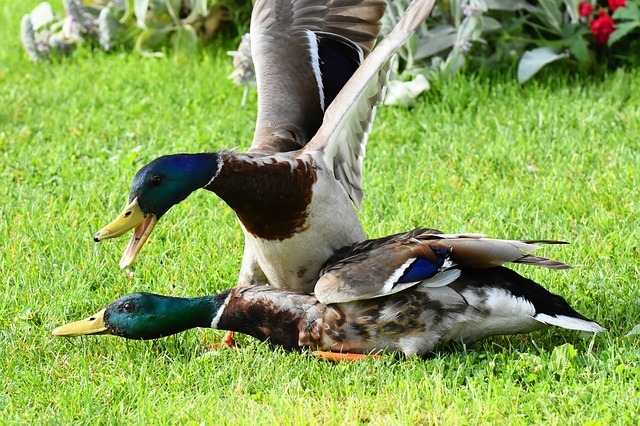 Hey Guys, Nick here at ebusiness boss today we’ve got one hell of a fight on our hands…. we look at jungle scout vs helium 10. If you’re an amazon FBA seller i’m sure you are going to enjoy this one. Jungle scout vs helium 10 has got to be one of the main battles when looking at the best amazon seller tools. these are two of the big boys and some people will probably disagree with what i have to say. I’m not here to go with the popular option, I’ve used both tools and i’m going to tell you guys exactly what has worked for me. As an Amazon seller i have used a load of tools over the years, I’ve wasted a lot of time and money on tools that didn’t give me exactly what i was looking for. We are all different, some of us like white bread and some of us prefer brown it’s all down to personal taste. It’s the same with amazon tools for sellers like me and you. Our perspective on a tool will depend entirely on our experiences. I’ve used both jungle scout and helium 10 A LOT of the last few years and i have to say they have both improved my business in some way. In order for me to demonstrate the differences we better look at what they both offer and compare it to the price. how much is jungle scout? I get it though, things aren’t always as straight forward as they seem. Sometimes when you actually start using a bit of software it becomes more expensive with additional ad on’s etc etc. We will run through pricing and then we will talk about the HUGE differences in functionality. Firstly you’ll need to make a decision. 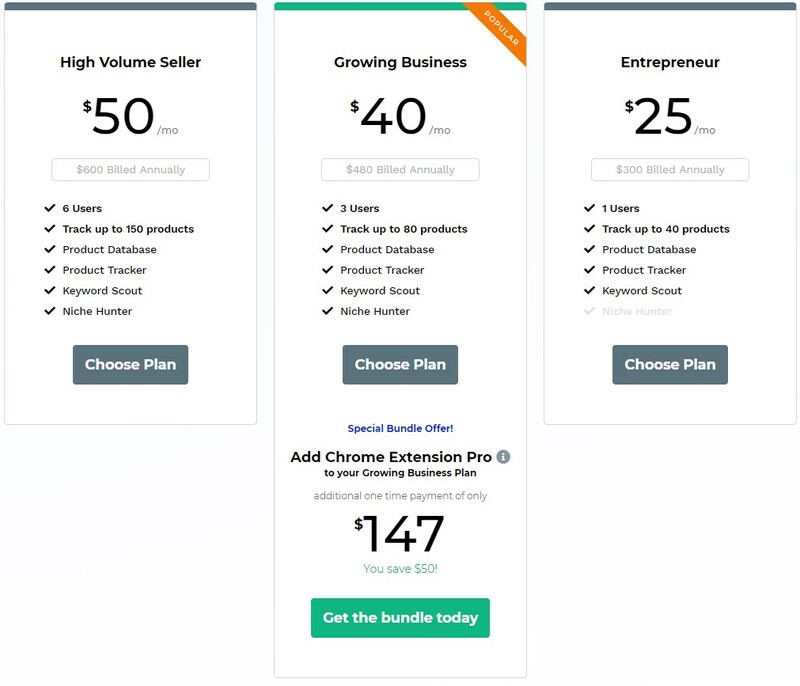 Do you want the web app or the chrome extension? Let me explain what you get with these jungle scout tools. I won’t go into all of the detail now if you’d like to know full details check out my review of jungle scout using the link below. Here you can carry out your product research using a variety of filters across different market places etc etc. You can also track products, to keep an eye on product metrics before making a final decision. You’ll also have access to their “niche hunter” tool, again pretty useful for finding profitable niches but that’s about as far as it goes. At the time of writing, the current jungle scout web app prices can be seen below. Before you jump into buying anything you’ll want to hear what i have to say about helium 10. As you can see, the answer to this is no. They will give you your money back within 14 days if you don’t get on with it. When looking at helium 10 vs jungle scout on this front, helium 10 take a clear advantage. Jungle scout have made a bit of an error here, i think they should consider adding a basic free plan. So… is helium 10 free? The short answer to this is yes, helium 10s web app and chrome extension can both be used for free. Before we jump to any conclusions, let’s talk about jungle scout’s chrome extension. Their chrome extension was actually the very first amazon tool i bought! It helped me a ton in the early days but i’m not one to get sentimental about seller tools. Let’s briefly look at what you get, for full details read the review i’ve written on jungle scout. 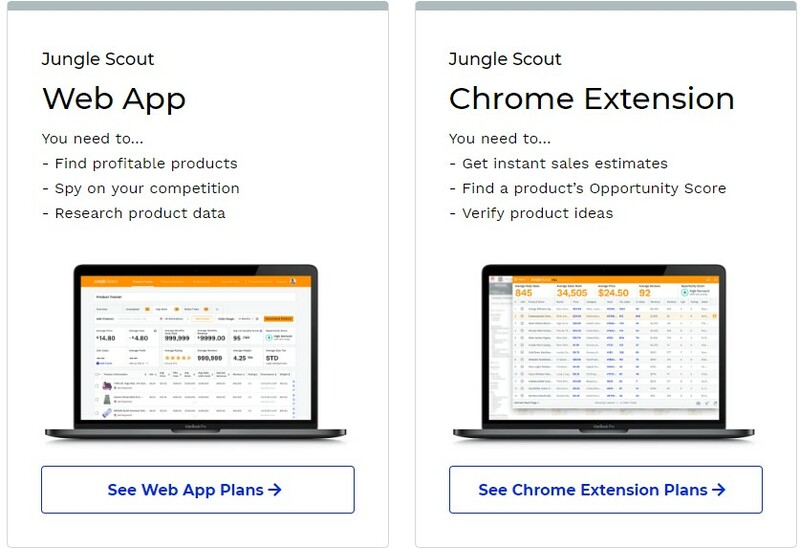 The jungle scout chrome extension allows you to find and validate product ideas. You can look at historical best seller rank, sales data and google trend analysis. It’s pretty handy to be fair, when i started out it was a god send! However i’ve found helium 10s data to be more accurate in some cases. A lot of amazon sellers argue about which one is more accurate… For me it was pretty clear. Anyway, in terms of cost you are looking at the following. 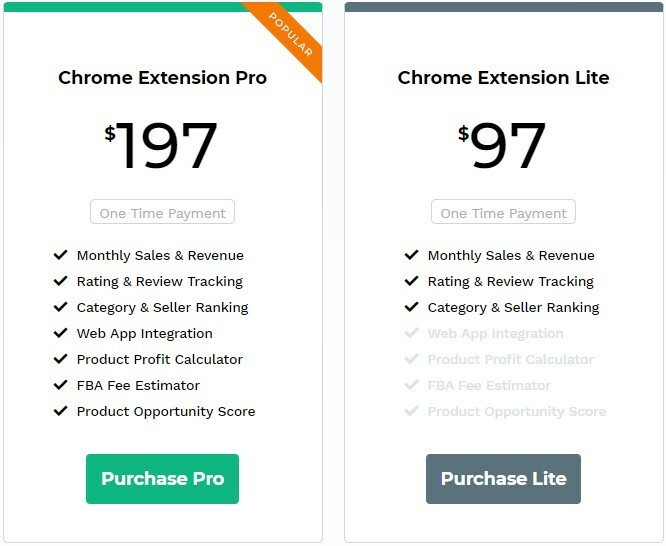 When i bought the chrome extension over two years ago it was $97, so not much has changed on that front. Some people swear by jungle scout, i used to as well but things have changed…. It’s only a fair fight if we look at things from both sides. Let’s switch things around… Helium 10 vs jungle scout – what have you got helium 10? Let’s look at the helium 10 tools – can this software really be so different? The simple answer to that is YES, they really can. It all changed for me in 2018, i wanted to take things up a level. I decided to take a course to improve my amazon seller skills. I’ve known how to run ads on Facebook etc for some time but i wanted to learn about chat-bots and generally improving my understanding of marketing principles. The course was excellent, it really took things up a level. Anyway, there was a lot of talk about helium 10 within the course and i wanted to see what all of the fuss was about. This is where the jungle scout vs helium 10 fight began (For me anyway). I’d heard little bits and pieces about helium 10 but i’d seen a lot more about jungle scout and Greg Mercer. I can only assume that Jungle scouts marketing team were going at things a little harder than helium 10. For me helium 10 offers a LOT more for the amazon seller. I now use helium 10 every day for a variety of reasons. Jungle scout is only really a product research tool whereas helium 10 is a complete suite of amazon seller tools. Ok there is a lot for me to mention here so i’ll keep it short and sweet. The course i took forced me to rethink my entire process as an amazon seller (i’m glad it did, i’d become lazy!). Once i’d improved my images and improved my customer communication mechanisms it was time to look at my listings. Did you know that for most products, the majority of sales will be generated by 3 – 5 main keywords. Helium 10 allows you to deep dive into your amazon listings. Thanks to helium 10 i now have a set process for my amazon keyword analysis. Here is a short video explaining how i use their “Cerebro tool” to compile a list of Master keywords. Is helium 10 better than jungle scout? Well in my opinion, yes because they offer more. Both bits of software allow you to do product research, helium 10 just offer a lot of other tools. Helium 10 have two decent tools in “Blackbox” and “Xray”. Helium 10 has TWELVE web app tools, and FIVE chrome extension tools. I use every one of their tools within my amazon business, if you take the time to understand what they all do i’m sure you’d do the same. 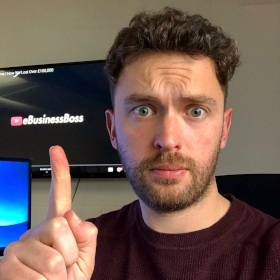 But i have written an article to explain exactly how i use each of the tools, if you want to give it a read click the link below. It’s a long article but there is a lot to talk about, i literally show you the inner workings of my amazon business. If you are looking for a quick fix helium 10 might not work well for you. It’s more of a professional tool for your business, it turns all of your actions into Data Driven Decisions and that helps me sleep at night. Once you’ve cracked it there is no looking back. Here is a brief overview of how i use three of my favorite helium 10 tools. This tool is solely for amazon product research, i find it really easy to use and it’s easy to find winning products. I’ll give you my top tip when it comes to amazon product research. Use helium 10 blackbox, choose your marketplace, select your category and set the filters to the following. Use these filters to find listings that are performing incredibly well with a poor overall listing. If you find a product you can sell, you can easily out do it with more images and a better looking listing. On top of that you could use helium 10’s review downloader to pull all of the negative reviews. Find out what the reoccurring issues are and see if you can work with a factory to create a product to deal with the issues. Do this in the right way and you’ll dominate the market. This is the perfect tool for competitor analysis on amazon. You can see exactly which keywords your customers are generating their sales from. I use this tool to ensure that every possible relevant, money driving keyword is present in my listing or backend (because why wouldn’t you). Once i’ve compiled a list of around 500 keywords i’ll use Misspellinator to find any common misspellings of powerful keywords amazon doesn’t auto correct! Unlike jungle scout this tool is completely free, although you are limited to 1000 requests. Here’s another short video running through how i use the chrome extension for my amazon product research. As mentioned earlier helium 10 offer free plans for both their web app and chrome extension. This for me is a clever move, it allows you to check out their tools risk free before you actually invest any money. See for yourself! Use the following link to sign up to one of their free plans. After taking the amazon course i ended up going for the platinum paid plan. I did this because it made sense for me and my business, if you can just make use of the free plan and save yourself money. The platinum plan works for me but it really depends on the size of your operation. 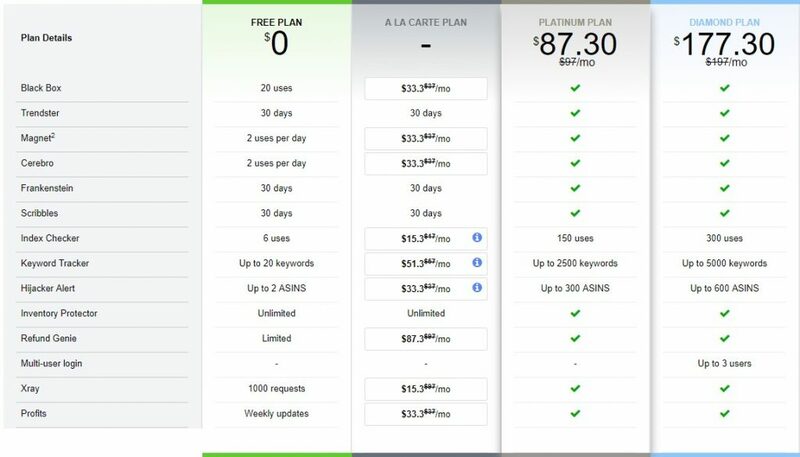 If you’ve got a real need for it the paid plans are worth their weight in gold. As a sever figure seller i need these tools to stay ahead! If you don’t fancy paying full price you can use one of the following helium 10 coupons. If you think you could do a load of damage in one month you might as well use the 50% off coupon. “Nick, if you aren’t sure use the 50% discount code and if you don’t like it you get to try the paid plan for one month half price”. Use the following helium 10 coupons to save yourself some money. I use helium 10 every day so the 10% off coupon just made sense to me. I’m sure you can see why i now use helium 10, it’s more than just a product research tool it’s an entire suite of amazon seller tools. It’s clear to see that the winner here is helium 10. There is a number of reasons but ultimately it comes down to value. I’m note saying jungle scout is rubbish because they aren’t, their product research tools are actually very very good. I need tools that help me analyse my competitors and deep dive into the inner cogs of my business. and that is Refund genie. This tool actually means i make money by using helium 10 each month. As we all know amazon make things complicated where they can, especially when it comes to reimbursing you. Refund genie allows you to generate monthly reports for all the inventory amazon have either lost or damaged. We pay helium 10 around $80 a month for the use of the platinum suite. That totals to around $1,000 a year. Over the last 18 months it’s nearly $10,000.00 – see the screen shot from our helium 10 account below. Anyway for me the battle is over in jungle scout vs helium 10. Helium 10 takes it for me, but we are all different! I hope you’ve enjoyed this article if you’ve got any questions or comments i’d love to hear from you below. Hi, do you still use both tools? If so why? Is there anything that jungle scout provides that helium 10 doesn’t? Hey Amy, we used jungle scout for a long time, they actually helped us find our first product! But we moved over to helium 10 a little while ago, they have A LOT more tools. It takes time to learn how to use them all but its well worth it in the end. Helium 10’s product research tools are just as good in my opinion, but to be fair i haven’t used jungle scout in a little while. In answer to the question about is there anything that jungle scout has that helium 10 doesn’t.. at the moment i’d say no. If anything helium 10 has a few more tools!